Is Southern California on your radar for travel destinations in 2019? With perfect temperatures and sunny year-round days, why wouldn’t it be? 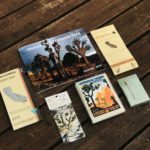 Last year we brought you The Ultimate Road Trip Guide to San Diego Parts I and II, and next week we will be sharing our road trip guide to Joshua Tree, an RVers desert dream location. In the meantime, we’ve rounded up the best and most RV-friendly campsites near the desert oasis that calls everyone’s name. From Palm Springs to Idyllwild, here are the top ten campgrounds in and surrounding Joshua Tree. Our list includes the most epic RV spots in this iconic destination, even during the busy season. Check out the campgrounds below. This campground, in prime location, is the largest in Joshua Tree National Park. It’s also a real paradise for rock climbers. Known as being the most family-friendly site in all of Joshua Tree National Park, this site is basically a playground for the little’s and grownups alike (we’re speaking from experience). Jumbo Rocks gets crowded fast, so be sure to grab a spot early, especially if you’ve got the kids with you! Pro Tip: Reservations are required during the busy season, which runs October to May. All campsites at Ryan Campground work on a first come, first served basis. If you want to enjoy this secluded paradise, make sure to come early in the morning to scope out and snag a site. This spot is only open October – May, and (like most of the campsites in Joshua Tree) is an ideal location for rock climbers/enthusiasts. With easy access to Mt. Ryan and Cap Rock, you’ll never be bored at Ryan Campground. Though this campground is located further from the majority of the parks main attractions, it is close to Twentynine Palms Highway, making it a great campground for those who want to explore the towns that sit right outside of the park. This sprawling site is the second-largest of all the campsites in the national park and is enclosed by billowing rock formations. Looking for an RV resort? Head over to Sam’s for a lush experience. Enjoy one of their four naturally heated hot mineral spas, private lake and heated swimming pool while paying a mere $60/night for your site. The resort offers picnic and BBQ facilities as well as a book exchange library, recreation room equipped with billiards and ping pong as well as a grassy volleyball court, horseshoes, tether ball and a children’s playground. Need we say more? This gem, located on the southern edge of the Wonderland of Rocks is a very popular site, and with good reason… it’s open year-round! It’s also home to its namesake trail, a one-mile loop that circles a small valley surrounded by tall boulders. 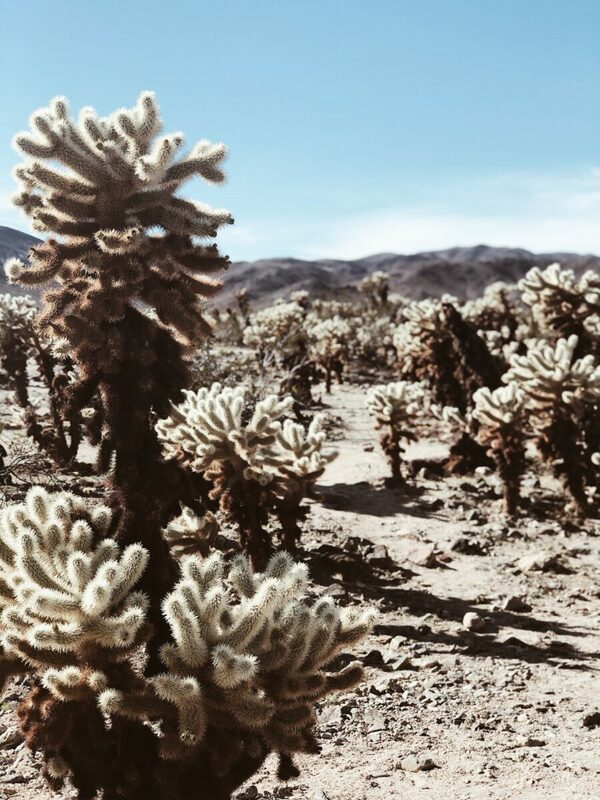 The trail shows off the parks iconic Joshua Trees and is a great hike to explore the parks plant and wildlife. 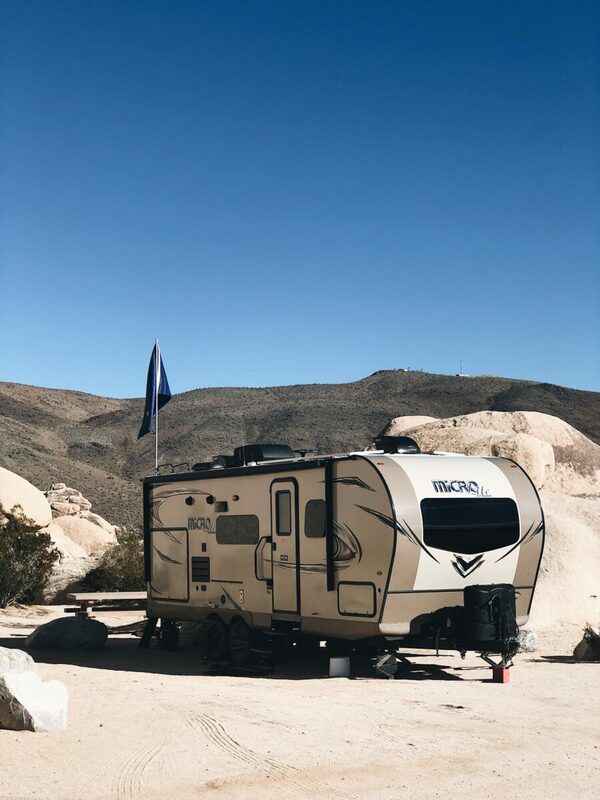 Located in Palm Springs (a mere 45 minute drive from Joshua Tree) this RV Resort is nestled at the base of the Santa Rosa and San Jacinto Mountain ranges. Talk about a stunning view! The resort offers full hook-ups as well as a fantastic golf course, full service restaurant, swimming pool, clubhouse, restroom facilities, WIFI and it’s pet friendly! Want to get away from the crowds? Make your way to Belle Campground. With only 18 campsites, this remote campground provides easy access to Pinto Basin and the Sonoran Desert in the park. Come enjoy the deserts gorgeous landscape and starry night skies all to yourself. 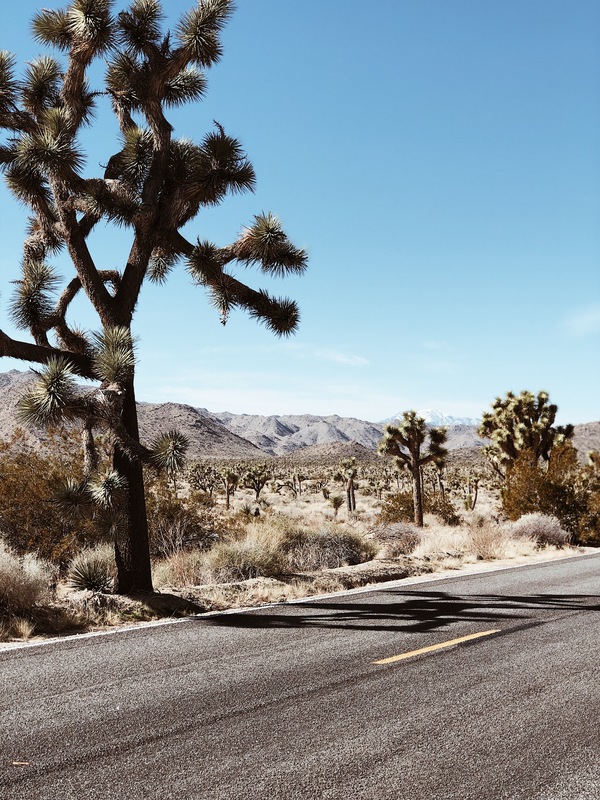 This state park campground is open year-round, making it an ideal location if you find yourself unable to lock in a campsite in Joshua Tree National Park. Another great perk of Mount San Jacinto State Park is its proximity to America’s crown jewel of the west, The Pacific Crest Trail. The trail passes right through the park, offering itself to RVers for hikes and the opportunity to share road stories with fellow travelers. Campsites are first come, first served at White Tank. RVs and trailers cannot exceed a maximum length of 25 feet at this remote spot. There is no available water, so make sure you bring in plenty. Think of this spot as your go to boondocking option in Joshua Tree National Park. Major perk – this site has unparalleled stargazing viewing. Idyllwild RV Resort is one of the very few campgrounds in Southern California that has all four seasons! At an elevation of more than 7,000 feet, this campground spreads over 200 acres in the Idyllwild wilderness. The Resort offers full hook-up sites as well as satellite TV, RV storage, laundry facilities and a dog park. 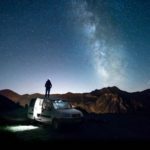 Looking for an RV for your 2019 travel adventures? Check out our Customer’s Favorite RV’s That are Selling Fast at our La Mesa RV Stores across the country. Are you traveling in your motorhome this spring? We want to hear from you! Leave us a comment on where you’ll be heading and in which rig for a chance to be featured on our Instagram. 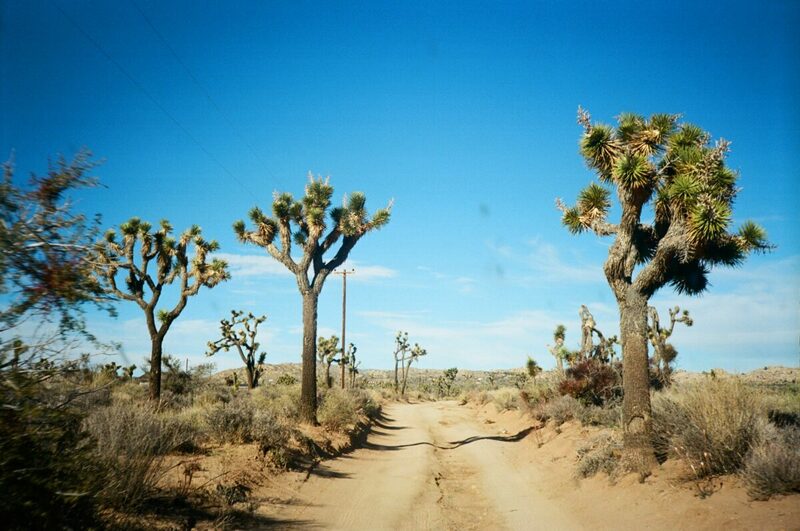 Hey Buddy!, I found this information for you: "Top 10 Campgrounds in Joshua Tree, California". 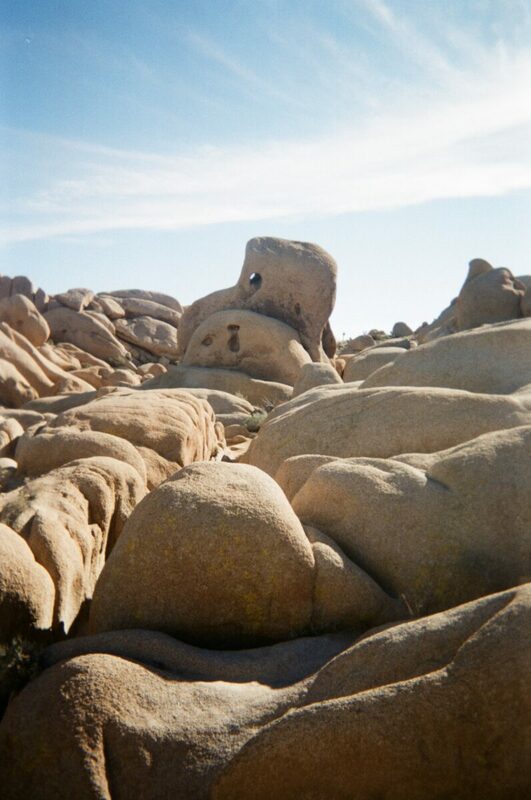 Here is the website link: https://experiencelife.lamesarv.com/2019/01/top-10-campgrounds-in-joshua-tree-california/. Thank you.